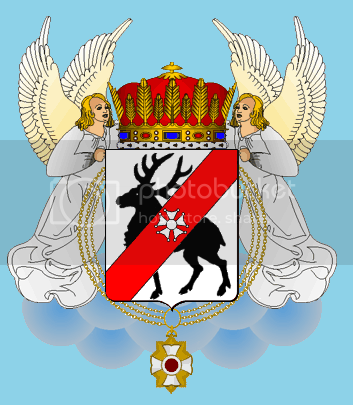 Astrid, Regent of Nidaros, to His Most Imperial Majesty Harald Thorstein I the Generous Giver, The Eternal Sovereign Viking Emperor, and to all other persons to whom this letter patent shall come, greeting. Know ye that His Most Imperial Majesty Harald Thorstein I the Generous Giver, The Eternal Sovereign Viking Emperor is hereby created a Knight Companion of the Most Noble Order of the Rose. Given at the Palace of Volsdame, the seventh day of April in the first year of King Audon's Reign.